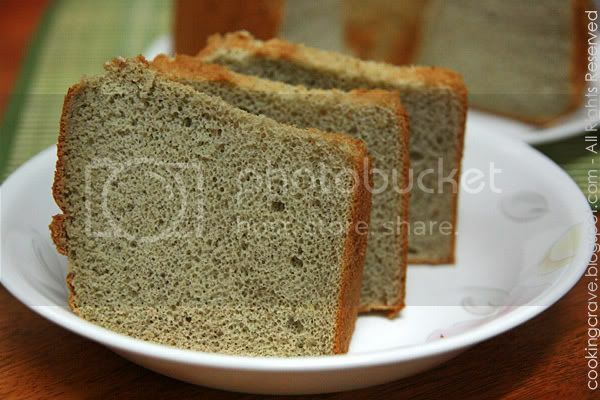 Chiffon cake is one of my favourite cake. I love it's spongy and soft texture, not too oily and very light. I don't even bother to find out it's recipe as I can get it at the market with cheap price. 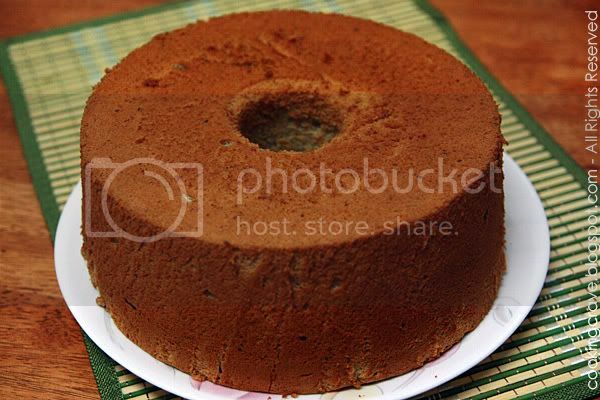 A friend of mine, Ai Lee borrow me her Chiffon Cake Is Done - Bake with Kevin Chai recipe book the other day. After flipped over the pages and read it, I finally make up my mind to try this Banana Chiffon Cake since I have all the ingredients needed. This recipe will be a great keeper for sure. My first chiffon cake turn out GREAT! 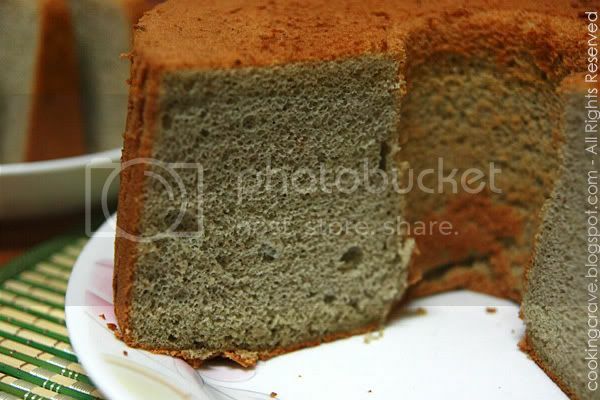 The texture of the cake are just nice, it's soft and spongy, not too moist or dry. I follow exactly the ingredient stated in the book without reduce the amount of sugar and the sweetness of the cake are just nice, not too sweet. I omitted the usage of banana essense and colouring. 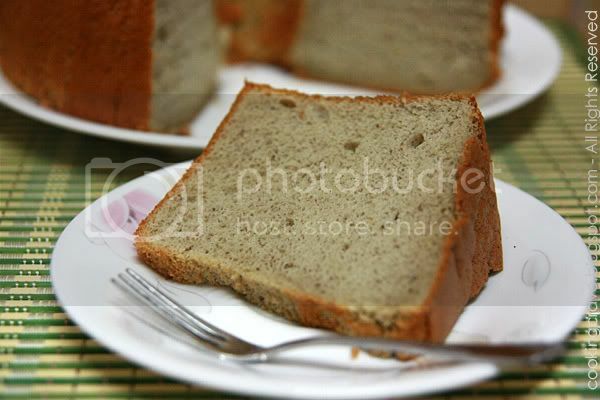 However, this cake still contain natural sweet banana smells on it even though without the usage of banana essense. To make egg yolk batter: Combine egg yolks, salt, oil, banana puree, essense (if you are using), sugar and colouring (if you are using) in a mixing bowl. Mix till well combined. Gently fold the beaten egg white foam into egg yolk batter until it's well blended. 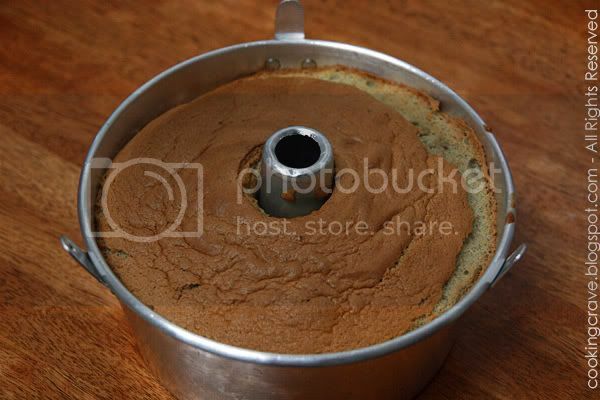 Pour batter into ungreased 9" (22cm) tube cake pan. Bake in preheated oven at 170c for 30-40 minutes or until it's cooked. Remove from oven, invert cake onto table until it's completely cooled before unmould it. This is a worth-try recipe. Do give it a try when you free. looks very good and successful! nice! 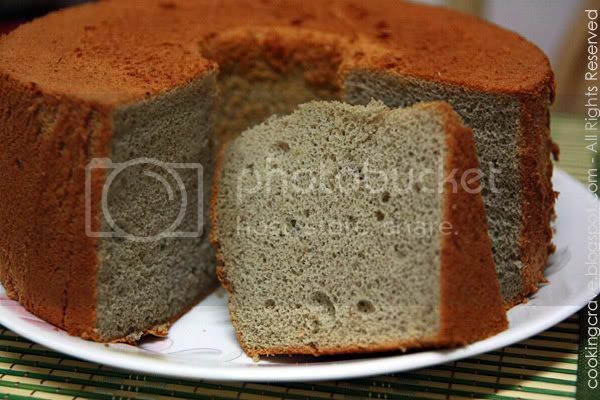 oh i didnt boil that for my eldest son no wonder he didnt grow tall enough.. now my daughter also same.. should have taken the trouble to boil la.. too late now.. sigh..
WOW ur chiffon cake is really successful! Hi, in your post you stated to "Gently fold the beaten egg white foam into egg yolk batter until it's well blended" , may i know how should the ending product look like then? would it look lumpy with bumps in it, or should it look like a smooth batter? Btw, the cake looks really good! hope i would be able to bake such a nice cake out soon without it haveing to deflate! haha!